being pinned to the sofa by a sick, sleeping baby is the perfect excuse to catch up on some blogging, don't you think? this is my happiest project in a long long while, the one that convinced me it wasn't an even slightly lunatic idea to fill my peaceful little craft room almost to bursting with an enormous, expensive new loom. 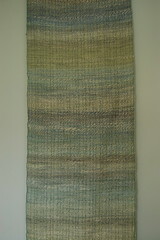 this is the project that made me think "oh right, i'm supposed to be a weaver!". i've come down a little from that high, i know i'll always be a dabbler, but it does feel that weaving absolutely has to be a part of that dabbling, to round it out somehow. anyway, the project started as an impulse purchase from squoosh on etsy. 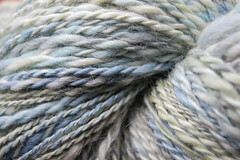 i've long yearned after the beautiful hand dyed fibres i've seen us spinners using, but that haven't been available here (although i see that's gradually changing, the most luscious fibres still seem to be over there). so when a friend mentioned that she'd like to learn to spin i thought it was an excellent excuse to get out my wheel again, which got me thinking about fibre, which got me browsing etsy, which is where we came in. it's mostly alpaca, some merino, some silk, in a beautiful smoky blue-green mix, that is showing not quite green enough in the pictures. it was an absolute joy to spin. i really haven't put in that many hours on my wheel, so i didn't start with much of a plan, just to let it be what it became. it became a reasonably-softly spun 2-ply (i tend towards stringy overspun if i don't pay attention) with lots of variation but averaging 12wpi (i.e. dk). then i decided to try weaving it on my spears #4. i think last time i mentioned spears looms here i was still on the #2 which wasn't a happy experience, but the 4 turns out to be pretty usable. the front and back beams have teeth to hold the warp and secure with wing nuts - a much better arrangement than the smaller loom (although i believe the #3, the inbetween size, has the same mechanism as the #4). the heddle has wire loops which can be awkward as the 'slot' threads can catch on these, and there's no place to rest the heddle in up- or down-shed positions, you just have to hold it. still, i'd done a practice scarf on it that had turned out okay, although it showed i needed to be more attentive to skipped threads as they're not as easy to invisibly mend afterwards as i'd hoped. for the warp i looked for something with a similar fibre composition, but tending towards the green side as i wanted to play up on the green and down on the blue. i found some very light guage wool/silk/cashmere on ebay, although the colour wasn't quite what i'd hoped the price certainly was. i cable 4-plied it on the wheel to bring it closer to 4-ply weight (i still wanted it finer than the handspun to give that a chance to shine) but when i wound the warp i realised i only had a third the amount i needed. since i couldn't face another plying marathon and realised i had a cone of green cashmere that was almost exactly the right weight i decided to mix and match. i striped the two yarns through the warp, hoping the colours would even out rather than look too stripy, but since the ends were doubled (that's how i warped the #4, not sure if it's the official way as mine is missing its instructions) it's a bit stripier than i'd have liked. it turns out i much prefer the colour of the cashmere, but i do like the gleam of silk from the other warp thread and the subtle lengthwise striping counteracts the horizontal stripes in the weft, so its all good. 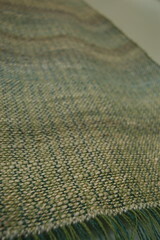 i had a sudden panic about uneven shrinkage and decided to give the warp a hot soak before i put it on the loom. 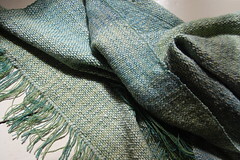 i love the softness and the drape (which i think comes from the silk content), i was worried the fabric was a little open on the loom, but now i think it's perfect, especially as the alpaca is so warm. i love the subtle colour changes, although there's one rather large chunk of green where both plies must have hit a green section together that i'm not so keen on, i'm paying more attention to colour distribution in my current spinning, bearing in mind i'm planning to weave that too.